Do you know the main reason why you have a high bounce rate? Yeah, you just read it right. If you have an eye-pleasing premium wordpress theme, people will not feel difficulty for looking at your blog for hours. In case you have a poor theme, they will close the browser tab right away while visiting your blog. All you get is the first few seconds to literally seduce your audience with your site design and color scheme. I know you are not too rich to hire a developer and get a custom theme created. So, the best thing is to choose a flamboyant theme from the web. In this article, I am going to share seven places to purchase beautiful themes for your WordPress blog. Maybe you are a newbie with no money to invest in your online business. In such a scenario, the confusion arises; free vs. paid themes. It is easier to say paid, but I know you are not convinced. I am sure that you can adjust a few bucks to purchase a premium theme. Still, the skeptical behavior draws you back simply because you don’t know the benefits of a premium theme. I couldn’t find out a significant advantage for free WordPress themes other than the label FREE. In my experience, I have found the following benefits for premium themes. Being a WordPress newbie, you can’t always install and make the WordPress theme usable all of a sudden. You may face some difficulty incorporating specific things. The same goes with any WordPress theme no matter free or premium. Let’s take the example of a user who installed a free theme. He wants to do some tweaks like color scheme change or logo width increment. Free themes come up no support. I repeat, NO SUPPORT. So, he has to hire a developer or request anyone to do it for him (provided he has no web development skills). Once you explain your issue, they will sort it out within no time. The fees they charge make them responsible as compared to the zero supporting offered by developers of free themes. You know how frequent WordPress rolls out updates, just like a typical blogger publishing regular posts. They have to do it provided tons of exploiters are trying to hack WP sites taking benefits of security loopholes. Each update fixes a lot of security issues and bugs. Our themes and plugins should also be updated to keep it compatible with new WP versions. Being a free theme user, you can’t avail regular updates. Yeah, most of the free themes are developed in a trivial way. Means developers worked on it once at the time of creation. As a result, one can’t always enjoy the features of a free theme like at the time of its release. Why because there are chances for some to be incompatible. Take the example of wordpress premium themes instead. When a user faces incompatibility issue, he will report it to the customer care. They know it will affect their reputation. So, the developers roll out updates regularly to make it stay compatible. You may not believe the following fact I am going to share. Some free WordPress themes are vulnerable. Yeah, they make your blog easy for hackers to sneak into. I have already told you that free WordPress themes don’t get regular updates. As a result, themes become incompatible with some of the WP’s inbuilt features. And, that may arise as a security issue giving a bypass for exploiters to get the backend access to your site. Very few WordPress themes carry malicious codes. The terrifying fact is that no one can sense the malicious trait right before or after installing the theme. The code takes in charge slowly and makes the health of your site at stake. There are no such issues with premium themes as every single one contains clean codes. Given that there are multiple theme developers, they strive to be the best rather than exploiting the users. All the premium themes I have used so far added an extra option to the backend whereas free themes didn’t. We all know it is quite tight for a non-coder to customize things on a WordPress blog without having a ready-made solution. In that sense what premium themes offer is mandatory for every blog. You can change the color scheme, add a logo, change the width of the same, boost SEO, insert ads and do a lot more from the theme control panel. On the other hand, you will have to do it manually in a free theme with the help of codes. Are you ready to do it? Some theme developers include a few premium plugins with their paid themes as bonuses. So, you get more than what you pay for. And, it surely enhances the functionality as well. You are familiar with the footer links on themes, aren’t you? Usually, the footer links point to the theme developers or the parent company. Nonetheless, it isn’t the same for all the themes. Free theme developers have a parasitic behavior to sell footer links. Yeah, they receive money to insert links on our websites. You can’t even find the proper code in the theme files. In case you try to remove the link, it will probably ruin all the design and most of the time redirect to the developer’s site. The do-follow footer links are almost suicidal, especially when it points to low-quality websites. Did I mean premium theme developers don’t include footer links? No. They do. You can remove the same manually or with the help of a plugin, though. And, deleting the link from your website will not create any issues as well. Keeping the footer links won’t be an issue provided the premium theme developers maintain the high quality of their sites. I hope you don’t need an introduction to Search Engine Optimization aka SEO. You are familiar with on-page SEO and off-page SEO as well. Have you ever heard of on-site SEO? It contains meta- description of your site and the internal code snippets. Most of the free themes are outdated. For the same reason, search engines overlook the same. A theme should have up-to-date, search engine friendly codes in it to perform well in search results. It is a proven fact that free themes don’t work the best in search engine ranking pages (If created by poor developers). The developers have zero commitment that they never care about how the sites with their theme work on search result pages. On the other hand, premium themes only contain search engine friendly codes. As I said earlier, they don’t have malicious snippets as well. Crawlers can recognize malicious codes, and it will even show a label (this site is infected) too. Now that you have read the benefits of premium wordpress themes, it’s time to get into the real action. I have handpicked seven best places from where you can pick up the top-notch themes for your WordPress website/blog. I know you may be hearing this name for the first time. That doesn’t decrease the quality of their themes, though. I hope you are not a person who regularly changes the blog design. Right at the moment, I am writing this review, they have ten different themes under their banner. You can choose from them based on the niche of your blog. They have feature packed theme panel with tons of options. One of the best specs is the ability to display your phone number on the header. In case you are offering any kind of services on your blog, this feature will come in handy. There are about nine different menus under the theme panel including custom 404 page, social media, comments and related posts. The theme offers two types of image compression to make your blog load faster. Moreover, you can increase your number of subscribers using Thrive Opt-in forms. These forms can be displayed above the fold, within content, and below content. It means you’ve enough control to display optin forms on all the necessary places to collect user emails. All the ten themes are fast loading that you won’t have to sacrifice the site speed. Once you install a theme from ThriveThemes, you get about eight widgets to show opt-in, social media icons, display tabbed content, etc. Thrive Leads is yet another plugin you get to use that shows different types of opt-in and grows your email list. A/B testing is also a great feature to analyze which opt-in form is performing better than others. The pricing is diversified. You can either go for single items or the whole membership packages. For bloggers and marketer, it’s best to go for Thrive Membership instead of paying for every single product. Are you looking for fast loading WordPress themes? Then, you should really consider MyThemeShop. The theme vendor has been in this domain for quite a long time now. I know you might have heard of the same. They managed to get some reputable users like Zac Johnson of Bloggingtips.com and Jeremy Schoemaker of ShoeMoney. In case you are skeptical about the speed of their website, visit Shoemoney.com and see how fast each page loads. 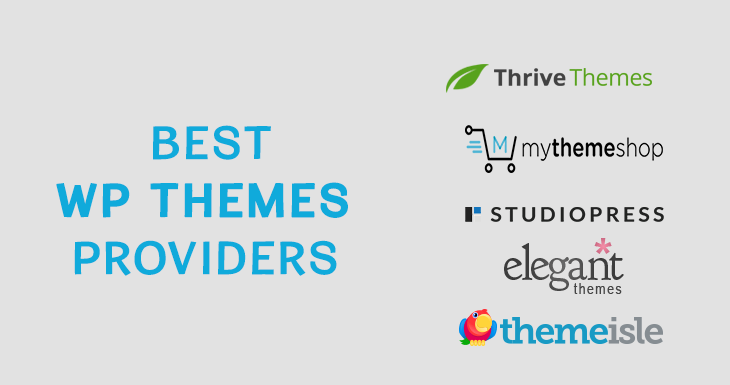 Being a customers’ favorite for quite a long time, they have 100+ themes and 20+ plugins under their belt. The count includes both free and premium products as well. The freebies allow us to have an idea about the performance. You can create a free account right now and use their free themes for some time to check whether it is worthy or not. All their themes contain clean codes that make it easy for you to customize and optimize. Socially Viral and Schema top in their list of best themes. The theme panel offers a lot of unique design features. You can even manage advertisements using the same. It is evident that inbuilt ad management is convenient. The membership package is available for $19 per month right now. However, single product costs your between $29 to $59 per year. StudioPress is one of the famous theme clubs of all time. They work on the basis of a parent-child theme system. You will have to install the Genesis framework before you upload any child theme. The framework puts the foundation whereas the child theme determines the unique design. StudioPress is a part of CopyBlogger Media. Their themes are being used by a lot of famous bloggers and site owners. If you are an admirer of fancy WordPress themes, I recommend you don’t look at Genesis themes. They focus on minimalistic design. The minimalism is what makes it stand out from the rest. StudioPress developers included necessary features only. As a result, you will not have to sacrifice the site loading speed. The neat coding makes all the themes search engine friendly. You can play with design aspects by changing color schemes and other things. If you have some web development skills, you can play with Genesis Hooks to get some extra items shown on your blog. Once you become a StudioPress member, you will not be limited by any means. You can avail unlimited customer support, updates and all their themes can be used for countless websites as well. Unlike other vendors, they don’t have a special edition for developers. You can buy Genesis Framework just at $59.95 along with a sample child theme. If you are looking for modern style or beautiful looking design, you have to pay $99.95 for framework + stylish child theme having some advanced features. To grab all the themes provided by StudioPress then Pro Plus account will be right fit for you and it cost you around $499.95. Next up on our list of best places to buy Premium WordPress themes is ElegantThemes. They have about 90 themes and a few plugins to offer. If you want the best themes regarding search engine friendliness, I recommend going with ElegantThemes because it really integrates the functions of a dedicated plugin into the themes. Even without a particular plugin for SEO, you can change SEO title, meta- description and canonical URLs. For the same reason, you can ditch using a separate plugin. The page loading time is below three seconds. And, it will help you reduce bounce rate. Talking about the design aspect, Divi builder itself is capable of doing wonders. All the themes have inbuilt ability to inject schema rating into search results. You have to make use of it while publishing a blog post, though. You can even create your own online stores to sell goods using ElegantThemes. The Divi page builder comes with some pre-designed templates to take the pain away from your head. There are three popular plugins you get with appropriate membership packages of ElegantThemes; Divi Builder, Monarch, and Bloom. I am using the last two ones on one of my blogs and, guess what? Both of them are performing well. They give you responsive customer support. A forum is available to solve your issues as well. As long as you become their customer, you will get all the updates. Unlike most of the other vendors, they promise a money back guarantee lasting one whole month. The fifth one in the list is Themeisle. Before I point out the features of their themes, I want to mention two aspects that show how they value their customers. In order to captivate the minds of customers, a seller should empathize with them. That is exactly what Themeisle developers have done. They launched 20+ premium themes for us. The surprise lies in the fact that each one of them has a lite version as well, allowing you to check the relevant features. When you check the demo or preview of their themes, you can also check how the backend works. Are you skeptical about it? Just click on the link given below. Once you get there, you will have to hit Admin Demo button. All we know that a username and password are needed to log into any WordPress admin panel. So, they want your email address to send the login credentials. When you provide the required info, you will get the credentials at once. The frequent updates keep your blog out of exploiters. And, with each update, they bring some new features as well. Although the customer support is not renowned for quick replies, your query will get an answer within one day. They have about nine plugins with impressive capabilities. There are three pricing packages with differences in price and features. The cheapest one costs $89 per year whereas you have to pay $199 for the expensive plan. Do you think you can’t start a blog because you have zero coding knowledge? I am sorry to say that you are dead wrong. Starting a WordPress blog doesn’t need any coding skill. All you need is basic computer skill. I know you are still not convinced given that theme customizations need coding skills. Yeah, I can’t offend you here as it is true. What if I give you a drag and drop theme? Will you change your mindset? Don’t be skeptical! All the themes from Themify can be customized in a drag and drop environment. They have developed a few plugins to enhance the functionality as well. Themify developed more than 40+ themes until now. With the help of their Builder plugin, you can ease designing a page as it makes the process quick and straightforward. The most popular theme of Themify is Ultra. It, in fact, is a multipurpose theme that the developers are working to widen the possibilities. I know you may be hearing the name for the first time. We all have a natural instinct not to trust anything new. That’s why Themify has launched some free themes. If you want to check the quality, design capabilities and speed of their themes, you should install a free one on any of your blogs. You can either purchase a single theme or take the whole membership. The first one costs you $49 and gives you a bonus of one extra theme as well whereas the second plan has a price of $89. You can also optin for a lifetime membership just at $249. Not every website runs on WordPress. I completely get it! Why did I focus on WP for until the last item in this list? It is simply because WordPress powers well over 7 million websites. TemplateMonster is not a dedicated theme club for WordPress. You can find themes for almost every CMS there. Moreover, both HTML 5 and Photoshop templates are also available. Once you check out their site, you will figure out that of all the theme marketplaces I shared here, TemplateMonster has an extensive database of themes. More than a thousand templates don’t mean they are sacrificing the quality. You get themes with superior features and quality. Even with a lot of customers, they managed to reach out to everyone who raises concern over their themes and plugins. Yeah, they have a wide range of plugins as well. All their templates are mobile responsive. The pricing is not similar to others in this list. You have to buy each one on their site for different prices. Wrapping Up – Which Premium WordPress Theme Provider I Choose? I have shared seven best places to buy best premium WordPress themes for your website. It is hard to choose only one from the lot because each one has its own advantages. Better you visit all the websites by yourself and check out the demos. Once you do the same, you will get an overview of the themes. Personally, I highly recommend using ThriveThemes because I am also using their themes for all of my WordPress sites. I have purchased Thrive Membership to get all the themes and plugins. Going for membership subscription will save you significant money compared to buying every single theme and plugin separately. You should bear the main topic of your website in mind while browsing through the themes. I hope you will share this article with your friends and followers on social media.